With this identity theft protection stamp, it’s quick and easy to ensure your private information stays safe. 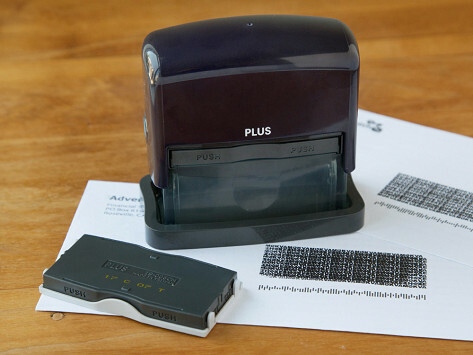 The stamp delivers an encrypted pattern in oil-based ink that penetrates paper, leaving text like your name and address unreadable on both sides of non-glossy paper. Use it on documents like bank statements, bills, and mail. Helps prevent identity theft by permanently blocking out addresses, account numbers, etc. Dimensions: 3.63" x 1.44" x 3.5"; Stamp Surface: 2.75" x 1"
Gave this as Xmas gift. Great for maintaining privacy. I really like this Stamp! It is as Saving me so much time in tearing out & shredding. It’s quick & does the blocking totally! I love this product it’s easy to use and fast!! Locking down sensitive information is as easy as a quick roll (or stamp). 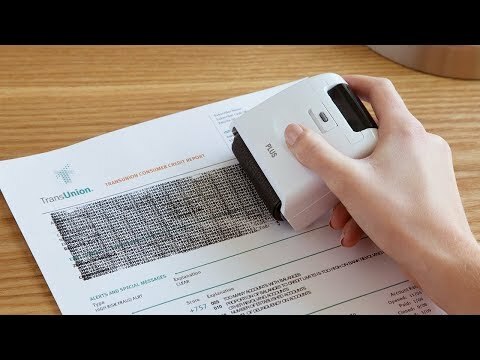 The identity theft protection stamps and rollers from Guard Your ID shield your privacy on things like mail, bank statements, and even prescription bottles. The stamps and rollers all deliver an encrypted pattern that renders text unreadable. The specialty roller uses a unique ink formula that works on glossy finishes—like postcards and labels—without smearing or rubbing off. And it’s shaped to work on uneven and curved surfaces, like prescription bottles. The wide roller and stamp use oil-based ink that penetrates non-glossy paper, so information on bills, checks, tax returns and more is blocked on the front and back. Using a stamp or roller is more convenient than shredding and more environmentally friendly, too. Paper is often un-recyclable once it has been shredded. Whether you roll or stamp, it’s a quick and easy step to ensure your information stays private.